Do you wish to make your hunting more successful in the first try? We have shared step by step instructions for you to improve your game in the hunting field. The preparation level or the accuracy of your hunting position does not vary in terms of the animal you’re hunting. Whether it is a deer, a buffalo or any large animal, hunters require equal practice and arrangement of equipment and aiming. Since hunters adopt using telescopes for the perfect sight and aim with their rifles, these instructions will turn out to be beneficial for them. When you’re in the process of mounting your scope in a rifle, check to make sure the reticle is properly leveled. The slightest mishap in terms of the reticle can change the entire scenario as the scope would be difficult to sight in that way. The scope rings need to be firmly fixed to the base and act as a secure ring around the scope. Further, make the reticle focus on the scope. When you’re peeking through the scope, make sure the crosshairs are in focus and pointed. To make this possible, aim your scope towards the bright, blue sky which will act as a background. Next, shift your focus away from the scope and view a distant item around you with your naked eye. Then, go straight to the scope and look through it and repeat. Since your eyes will accustomed to looking at the reticle for some time, making snap judgments is crucial. However, if trying out this method results in blurry vision, find the diopter adjustment and twist it. You will find it attached close to the shooter. Make sure you keep practicing this method until you get a clear sight. 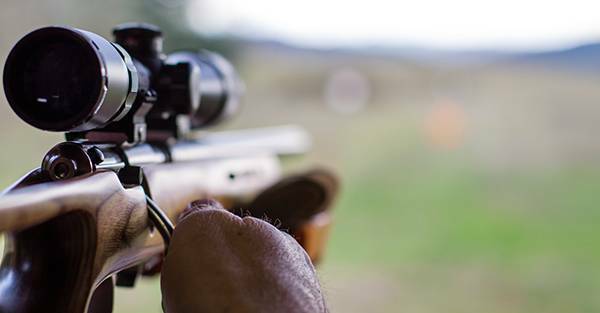 Bore sighting before shooting with your rifle is a preferred method. Make certain that the barrel is unhampered and the rifle has not been loaded yet. Positioning it downwards, get rid of the bolt on your rifle and mount it in a guarded spot. Fixed behind the rifle, you will have to cautiously move your rifle to aim straight towards your target whilst peeking from the bore. Fixate your scope in a way that the reticle adjusts at the centre without moving your rifle the entire time. Note that upward and downward elevation is handled by the turret based at the top of your scope whereas the left and right wind is adjusted with the help of the turret on the side. Do not fret over making your bore sight 100 percent accurate since that isn’t essential. Just ensure that it is close enough for the rifle to hit at least at 25 yards next anywhere on the target. When you are confident about the completion of bore sighting, you are ready to shoot. Before embarking on your hunting quest, the ammunition used to sight in your rifle should also be considered while on the hunt. Using a brand or a bullet that is different from the type of ammunition used to sight in your rifle will not give you the desired result. Try beginning the shooting by going for 25 yards first and then fine tuning the zero position when you’re going for longer distances. This method helps save time and even your ammunition. There won’t be any frustration build up that makes you avoid taking a shot at 50 yards or more which fail to hit the targeted object. 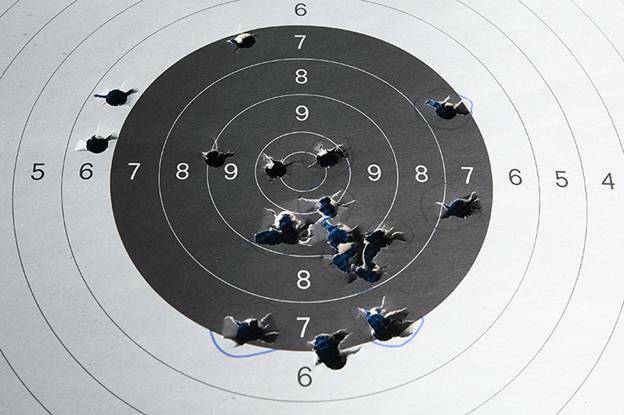 At 25 yards, once you reach a precise aiming position, don’t bother achieving the exact target. Make sure that the place you’ve chosen to shoot from provides enough support and gives the right amount of balance. Using a zero target which comes with a grid format instead of bulls-eye targets can make you excel at making the right adjustments. Avoid using the muscles as your support since the precision results will differ as compared to using a shooting bag which comes with a guarantee tag of being the most stable object for shooting. If your barrel gets heated up while sighting in, let it cool down. Otherwise using a hot barrel might affect the performance. 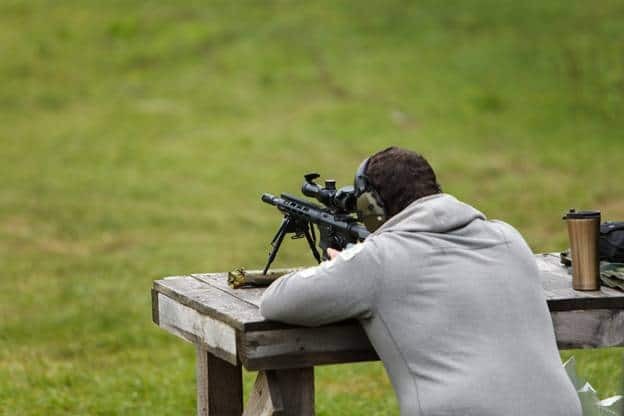 When you are using a rifle for shooting, you must understand what is meant by MoA, or the Minute of Angle. It is a unit of measure that is used for the accuracy of a rifle. Moreover, to understand what is the "1 MOA grouping" you must first know what is the minute of angle is. Measurement of angles can be best explained by understanding what you probably learnt back in your elementary school mathematics class. The measurement of angles can be degrees and minutes, or even longitude as well as latitude when you are reading maps. These are all the measurement of angles. When this applies to a rifle, for example if somebody says, 1 MOA or 1/60 of 1 degree that is the considered as the angular spread which can be measured on a 100 yards. This is considered an angular measurement and it obviously changes when it comes to different distances. Almost all manufacturers of rifles claim that their rifle can shoot the SUB MOA. In the field however, at 100 yards a shooter would be expected to shoot a 3 shot within a 1 inch circle or even less, on 200 yards they are expected to be within 2 inches and for 300 yards at 3 inches at least. This kind of shooting is not easy, no matter what rifle you are using. When you are on a hunt, this type of precision is more than enough. Most of the hunting in North America usually includes goats, deer, antelope and bear, all of which fall into the category of medium game or medium sized big game. The perfect rifle is needed to target the heart and lung area which comes in the range between 8 inches to 10 inches.